Built as a barbican by King Edward I around 1275, the Lion Tower took its name from the fact that it was later used to house the Royal Menagerie. Visitors to the Tower in the late 13th century would have crossed a causeway and drawbridge over the moat to reach the semi-circular Lion Tower before then heading on, via another causeway to the Middle Tower (the place where you now enter). It would seem that the Royal Menagerie – which included lions, leopards, mastiffs and other assorted animals – was housed here by 1335 (there is a document dated three years later which refers to the ‘Lion Turret’) and it is known for certain that it was housed here from the 16th century until the menagerie was disbanded in the 1830s and the animals removed, some of which were presented to the Zoological Society of London. The animals were kept in two stories of wooden ‘houses’ set around the inside face of the tower – these were refurbished during the reign of King James I, an exercise yard was added on land reclaimed from the moat and an improved viewing platform from which to watch the lions was added (people were charged a small fee to come and view the animals). Modifications were again carried out in the 1770s. The Lion Tower and the surrounding complex of buildings were finally demolished in 1852 to make way for a new ticket office. The foundations of the tower can now be seen as you enter the tower. For more on the Royal Menagerie, see our previous entry here. 9. Treasures of London – Admiral Lord Nelson’s coat: part of a series looking at some of the many, many ‘treasures’ of London, this piece focused on the coat which Admiral Lord Nelson when he was fatally shot aboard the HMS Victory during the Battle of Trafalgar and which can now be seen at the National Maritime Museum in Greenwich (complete with bullet hole). A new exhibition has opened at the Tower of London celebrating the Royal Menagerie which was located there for more than 600 years. Over the years featuring everything from lions and leopards to elephants, camels, kangaroos and crocodiles, the menagerie was founded at the Tower of London during the reign of King John (1199-1216), although as far back as the reign of King Henry I (1100-1135) animals were being presented to the king as gifts. Some notable early animals included a ‘white bear’ believed to be a polar bear from Norway and an African elephant, a gift of King Louis IX of France, both of which were presented to King Henry III. While the early location of the menagerie – which had a long history of attracting curious sightseers – remains unknown, during the rein of King Edward III (1327-1377) there is reference to it being in a position near the Middle Tower (now the main entrance to the Tower) which suggests it was then already located in what became known as the Lion Tower – a now ruined barbican built by King Edward I in 1276-77. Animal accommodations in the Lion Tower were substantially upgraded during the reign of King James I (1603-1625) – James was noted to have enjoyed watching the lions fight other animals in the tower’s exercise yard). Further upgrades were made under the watchful eye of Sir Christopher Wren, then Surveyor of the King’s Works, between 1672 and 1675. The office of the menagerie’s ‘keeper’, meanwhile, had been formalised in the 1400s with the title awarded for life – it was subsequently held by some important officials. While in 1687 some of the beasts and birds were transferred to new accommodations at St James’s Park, the menagerie remained at the Tower until 1830 when, following the death of King George IV, the decision to move the animals – then said to number 150 – to the recently founded Zoological Society of London’s zoo at Regent’s Park. Initially only some animals were sold to the zoo but by the end of 1835 the menagerie had been completely emptied with many of the remaining animals apparently sold to an American ‘showman’ Benjamin Franklin Brown who exported them to the US. The new exhibition, Royal Beasts, is housed in the newly opened Brick Tower (entry via the Martin Tower, itself entered via the wall walk), and gives visitors views from a hitherto closed-off part of the north wall. 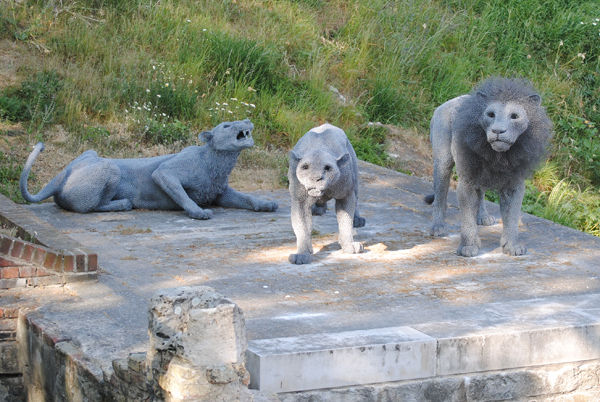 There are also a series of life-size sculptures of various animals (see the three lions pictured), created by artist Kendra Haste, located around the tower. And, to gain a feel for how the menagerie was viewed during different eras, you can watch the short live action show featuring some of the “rarees” and “curiosities” which were housed within the tower (check with staff for times). 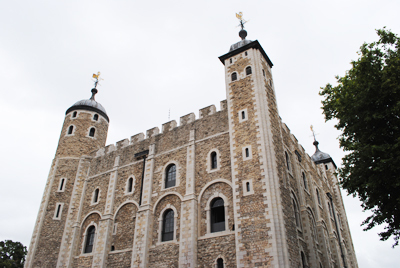 For more on the menagerie’s history, see Geoffrey Parnell’s guide, ‘The Royal Menagerie at the Tower of London’, available for sale at the Tower (£3.99). 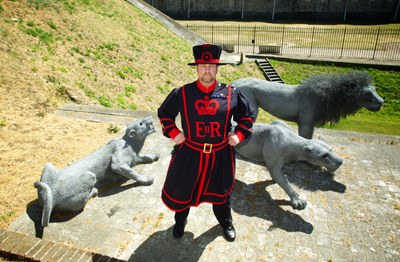 WHERE: ‘Royal Beasts’, Tower of London (nearest tube station Tower Hill); WHEN: 9am to 5.30pm, Tuesday to Saturday, 10am to 5.30pm Sunday to Monday (until 31st October); COST: Included in Tower of London admission – £19.80 adults; £10.45 children under 15; £17.05 concessions; £55 for a family (prices include a voluntary donation); WEBSITE: www.hrp.org.uk/toweroflondon/. • The history of the Royal Menagerie is the focus of a new exhibition on now at the Tower of London. Royal Beasts explores the history of the Tower menagerie which, founded during the reign of King John in the early 1200s, remained there for more than 600 years. Among the animals were lions (the first record of which dates from 1210), a grizzly bear (a gift from the Hudson Bay Company to King George III), elephants, tigers, ostriches and kangaroos. Highlights of the exhibition include modern animal sculptures by artist Kendra Haste and interactive sensory displays. The recently restored north wall walk and the never before opened Brick Tower will host some of the displays, including sights, sounds and smells of some of the animals. See www.hrp.org.uk/TowerofLondon. • A 1938 tube train will run along the western end of the Piccadilly Line this Sunday (that’s Father’s Day in case you’ve forgotten) as part of the London Transport Museum’s Heritage Vehicles on the Move 2011 programme. Leaving Northfields, the train will travel to High Street Kensington via Earl’s Court (crossing from the Piccadilly to the District Line in a move not normally experienced by the general public) before heading back down the District Line to Acton Town where it will change back onto the Piccadilly Line. The train will then undertake the “fishhook move”, visiting Heathrow Terminal 4 before going to Terminals 1,2,3 and 5. The entire journey is expected to last about two hours. Tickets, which can be purchased at the museum ticket desk or by calling 020 7565 7298, will need to be collected at Northfields Station. For more, see www.ltmuseum.co.uk/whats-on/events/vehicles-on-the-move. • Lambeth Palace Library is celebrating the 400th anniversary of the King James Bible with a new exhibition. The exhibits include a 1611 edition of the Bible as well as Medieval Bible translations, landmark editions of the Bible which drew on the textual scholarship of the Renaissance and Reformation and early printed vernacular versions. Runs until 29th July. Admission is by pre-booking only. For information on buying tickets and more, see www.lambethpalacelibrary.org/content/2011exhibition. Although royal connections with St James’s Park, the oldest royal park in London, go back to the time of King Henry VIII – it was he who first purchased the marshy watermeadow in 1532 with the idea of creating another of his many deer parks, it was on the accession of King James I that orders were given for the swamp to be drained and landscaped. The landscape features included a large pool known as Rosamond’s Pond at the west end and, at the east end, a collection of waterways and islands used to attract birds that could then stock the royal larder. There was also a flower garden next to St James’s Palace (this had been built by King Henry VIII). Among the other uses King James I had for the park were as a site to keep the royal menagerie which included exotic animals like crocodiles and camels. There were also bird aviaries placed along what is now appropriately named Birdcage Walk. The layout of the park became more formal during the later reign of King Charles II who had been inspired by what he’d seen while in exile in France. 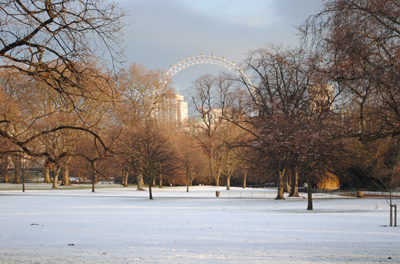 PICTURE: Looking across St James’s Park toward Whitehall in the snow.